The full title of Mike Nelson’s work is so verbose there’s no room for anything else in that opening paragraph. It is, like the work itself, overwhelming. If I could adequately describe it, Nelson would not have had to make it. Indeed, it has taken him four weeks to say something here, and the results left this visitor speechless or at least thought-free. Yet part one refers to a text, the Mysterious Island by Jules Verne. A one page introduction is pinned to a noticeboard in a corridor. The coffee stain on this photocopied page hints at the chaos to follow. Part two is an artist’s workshop. This project was borne out of a residency here in 1998. So now we see what his office might have looked like. Reading material by Marx lies alongside a magazine for Mustang enthusiasts,. He jests surely, or does he? Moving through another door, we step out into part three. From deep in the midst of this sprawling and towering installation it is hard to get a fix on it. A crackling radio adds to the disarray. Stepping away, we see the corridor and workshop from parts one and two have been augmented by a wire mesh coop, a sun deck and three looming stepladders, suggesting a modern Golgotha. 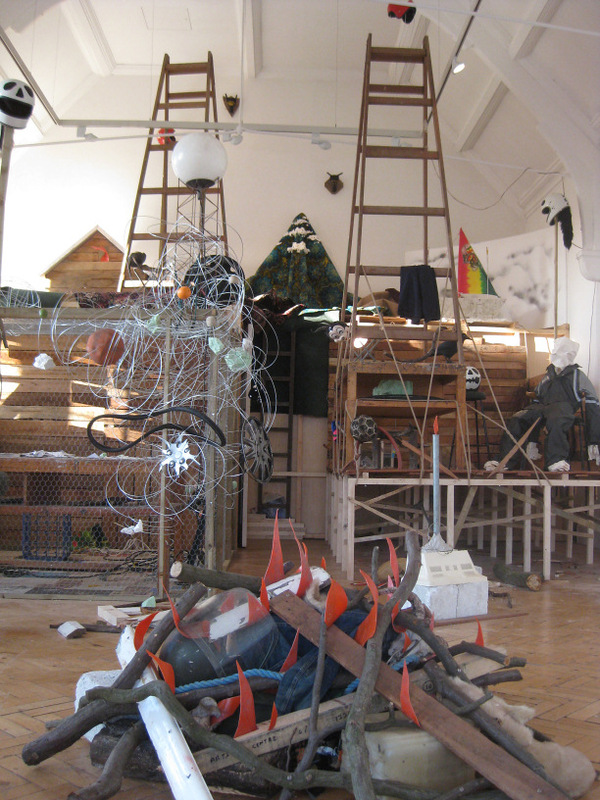 Among the debris, we notice Mickey Mouse heads with horns, baseball caps mounted as hunting trophies, crash helmets on poles, and a figure captive in a chair. So what is this? This, it seems, is Nelson’s Mysterious Island, part Swiss Family Robinson, part hide-out for satanic bikers. This is make-shift civilisation and barbarism side by side. This, clearly, is an artist making themselves royally at home. Trespass at your peril. Temporary Monument is back on display at Camden Arts Centre as part of Simon Starling: Never The Same River (Possible Futures, Probable Pasts). It took the artist four weeks to recreate.